What influence does Advertising and Packaging have on Brand Loyalty? Everyday we’re exposed to thousands of branded messages. As a result, we subconsciously lean towards brands based on trust and emotional feelings. Brand loyalty is a sensible buyer strategy. Consumers become loyal / build preferences to brands through repeat purchase. It’s less risky and more convenient for consumers to pick a brand they know and trust. Why spend time agonising over another brand when you’re already familiar with one. Over the years there have been many tests to prove that branding can distort preferences. A popular example is a Coke vs Pepsi taste test. 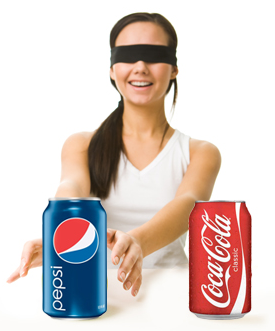 When blindfolded the majority of consumers cannot taste the difference between the 2 brands, but when the blindfolds come off memories are triggered causing people to have a preference with people leaning towards Coke. In another test (Robinson 2007) McDonalds food was given to kids (yes great idea especially with the issues with kid obesity), one item had the McDonalds packaging and the other not. Kids automatically preferred the branded food as a superior taste. Another important take-away from the test was the more television sets in a child’s house the more likely they would select the branded option. In these 2 examples all the effort marketers put into adverting and packaging pays-off with users expressing brand loyalty. Price can affect loyalty, especially with FMCG products, which is a low involvement purchase decision. Breakfast cereals, yoghurts and deodorants which are bought more frequently are continuously on sale in attempt to woo buyers away. Brand loyalty for these brands is between 15 – 30%. However, after the sales finish, most shoppers return to their preferred brand. In another example, car brands have a higher loyalty rate of around 50%. The higher rate is partly due to the fact that on average we only buy 2 new cars in our lifetime. Over half of buyers buy the same car make as they previously owned, hence why car manufactures have cars to suit all stages in our life. There’s no doubting advertising and packaging plays an important role in influencing our brand loyalty. To what degree consumers become loyal or lazy (convenience) does depend if it’s a low or high level buying decision. For more insights checkout Chapter 7 of ‘How Brands Grow’.